Iconic as a central meeting place in London, Trafalgar Square also seems an appropriate symbol for a day when so many countries and cultures will come together. Speaking of coming together, strangely, only two pigeons appear in the photo when actually there were heaps of them all over the square that day. This entry was posted in Europe, Photography, Travel, Uncategorized and tagged England, Lodon, pigeons, Trafalgar Square, United Kingdom by stephglaser. Bookmark the permalink. 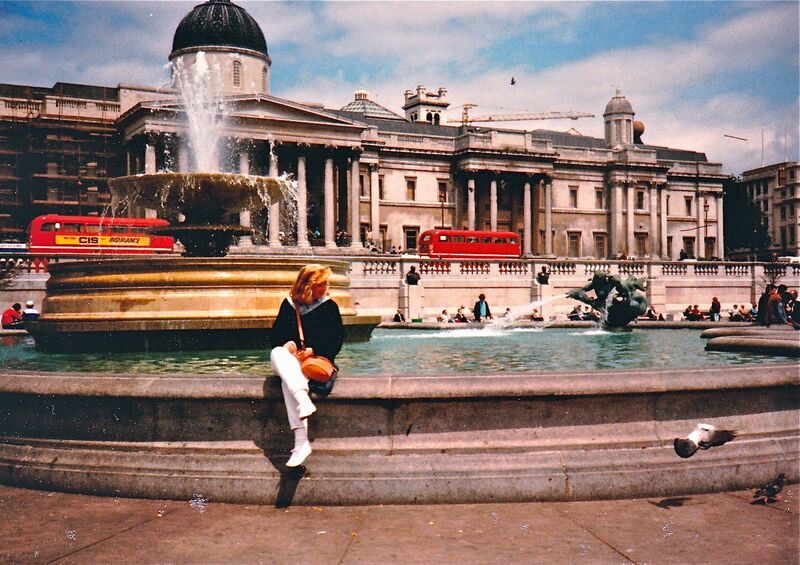 To manage to take a photo of Trafalgar Square with only 2 pigeons in it Steph, is nothing short of a miracle! They are literally everywhere as you know! I watched the opening ceremony on tv this morning in Bali, and I have to say I felt quite proud. It was quite an amazing spectacle! Did you manage to see it? Yes! I always love the opening ceremonies and the parade of athletes/nations. It was, indeed, spectacular and impressive. I definitely can see why you felt proud. It was very cool to see the British athletes come out in the end and hear the roar of the crowd. I’m looking forward to seeing more of the games and the stories about London that we will get in the US. I’m so glad you were able to see the ceremony in Bali. As always, thank you for your support, Lottie. I do think it was a feat to get only two pigeons in the photo. I don’t recall if we had scraps for the birds that day. But, clearly, we must not have had any food with us.